In the early 20th century the hugely powerful British Empire spanned the globe. As its colonies gradually became independent, many of them retained their ties, forming the Commonwealth – in the 2000s an association of over 50 countries which met regularly to focus on business, political and social matters, and to compete in the Commonwealth Games. The British Empire was the world’s largest and most powerful empire. Its first colonies were in North America, and it later stretched into Asia, Africa and the Pacific, including New Zealand from 1840. The empire ended – mainly peacefully – in the half-century after the Second World War, as its former colonies became independent. In the 2000s, just over 50 of these countries made up the Commonwealth. From the mid-19th century independent governments were set up in a number of British colonies dominated by white settlers, including New Zealand. These self-governing states were called dominions, and became known as the ‘British Commonwealth of Nations’. The British Empire had two great trading networks, based on the Americas and on India and surrounding areas. At first New Zealand imported most manufactured goods from Britain. Wool, and later frozen meat and butter, were exported – mostly to Britain. When tariffs on imported goods were introduced to support local manufacturing, Britain protested, and tariffs were made lower for countries in the empire. This primary trade relationship began to come to an end when Britain joined the European Economic Community (now the European Union) in 1973. British troops fought in the New Zealand wars of the 1860s, but by 1870 they had all left, despite New Zealand’s pleas for them to stay. From the 1870s Britain provided naval protection in exchange for New Zealand agreeing to provide bases and take part in Britain’s wars. 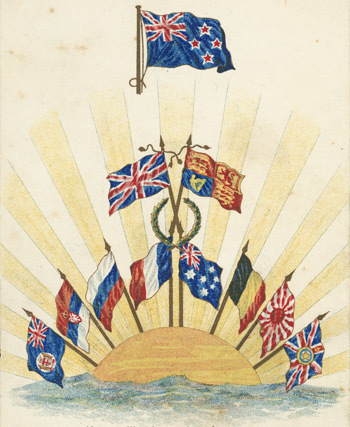 New Zealanders supported British troops in the South African War and the first and second world wars. After the Second World War the British colonies became independent, and most joined the Commonwealth. The Commonwealth Games were held every four years, and from the 1970s the regular meetings of Commonwealth prime ministers were known as Commonwealth Heads of Government Meetings (CHOGM). South Africa left the Commonwealth in 1961 because of criticism of its apartheid system; it returned in 1994, after the end of apartheid. In the 2000s the Commonwealth focused largely on three areas – political, business and social matters.